Anna Frances Goellner is proud to roll into her second and, sadly, final year of Journalism. She did it - she’s a senior! Stickers still cover all of her belongings, and she loves to paint ukuleles (and play them, too...of course). Lavender plants, dogs, and classic literature are some of her most favorite things, as well as ART (she’d love to Vincent van Gogh to an art museum with you). Her favorite shows are Parks and Recreation and Brooklyn Nine-Nine, and she loves Wes Anderson and Studio Ghibli movies. She’s proud to represent every book nerd at North Forsyth as the National English Honors Society president. Anna is also a Raider Commander Captain. 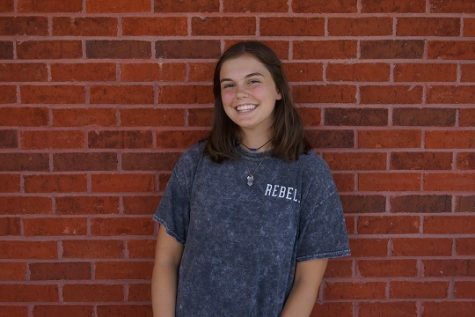 With a love for books, poetry, and writing, she is excited to represent the NFHS students as a Staff Writer, and she hopes to jump into the world of creative writing as soon as she graduates. Even though she’s lactose intolerant, she’s always cheesin’!